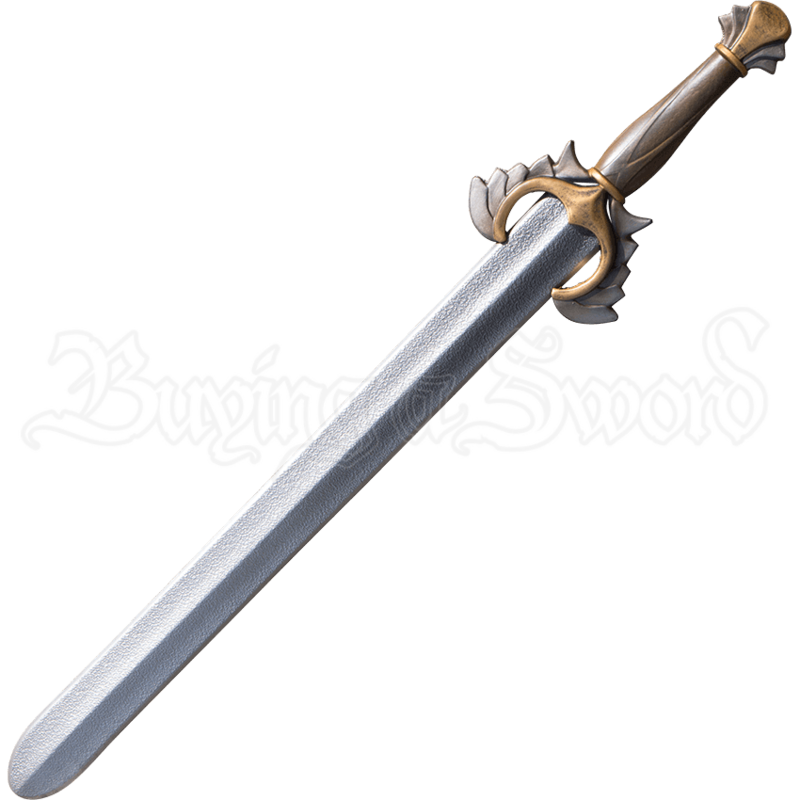 For holy warriors and those pure of heart, the Angelic LARP Sword is a worthy weapon. This fantasy LARP sword is made of Epic Foam in a latex-free construction, perfect for paladins, crusaders, and other divinely inspired fighters. The sturdy, innovative construction of this handcrafted LARP weapon makes it safe for tough battles as well as mostly maintenance free. Arched angel wings form the crossguard of the hilt, curling upwards towards the double sided, center ridged blade. Hand painted antique gold and silver tones decorate this crossguard and the matching pommel, and the sword handle has a realistic wood look and comfortably curved structure, assuring a firm and natural grip. Polyurethane cast construction allows for the excellent level of detail throughout the hilt. Whether you are a soldier on a divine quest or a heavenly being from the realms of fantasy, the Angelic LARP Sword is the perfect companion for live action roleplay adventuring. This foam LARP weapon is approximately 29.92 inches in overall length. This measurement will vary as each LARP sword is a handmade item. Stronghold weapons are designed for tough LARP combat and have a unique Epic Foam construction that does not contain latex and requires little to no upkeep. They weigh the same as latex weapons, have cushioned edges, and are stab-proof, making them safe for LARP battle. The hilts are made of polyurethane foam for high detail and practically maintenance-free durability.